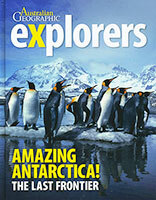 Australian Geographic Explorers: Amazing Antarctica! It was the last continent to be discovered and large parts of it are yet to be explored. Antarctica truly is one of the world's last frontiers. So come with us on a journey of discovery across the very large, icy, white world at the end of the Earth. You'll find a place where penguins march, whales and seals splash and most animals depend on tiny prawn-like creatures called krill for their survival. Australian Geographic Explorers: Our Capital City!